I remember when i could feel my faith was telling me that i will be healed completely, but later on that day when i saw my eczema got so worse, when i couldn’t bear the itch and when it stressed me out, my feelings told me my biggest fear of the future. The devil seems to show me scenes of living forever with worsen skin, cancelled marriage, helpless, no more normal life, and intimidated future. This is when i could feel my fear. I’m afraid, i’m worried, i’m discouraged and dismayed. I’m here to tell you that Faith is not a feeling. It is beyond our feeling. Trust your faith no matter how you feels. How often when we feel so guilty, so full of sins, so not deserve to even pray – we feel distance with Jesus? Or even when you feel so disgusting, (i know exactly how that feels – i felt so disgusting when i was filled with those oozing eczema, i even disgust myself. You know i used to feel disgust when i saw little things grouping for example ants gathering, hammered dots on walls – it creeps me out. But then all of sudden i had them on my own skin! I have to see those creepy things worse on my skin, everyday.) you keep your distance with your love ones, your friends, your family and even strangers, because you felt disgusting – you felt cursed. Just like these ten leprosy men, they kept their distance with Jesus because they felt disgusting for the leprosy. They didn’t dare coming near to Him. Even when you feel distance, just call His name. God is too big, His power and mercy we never could understand, but there is only one thing He can’t do – He can not hate us. His loves endures forever, God is Love (1 John 4:8). So how can Love, not love? He doesn’t just love us, He is Love Himself. That’s why don’t trust your feeling if it brings you farther from Him. We human tend to feel insecure, we tend to believe what is seen – that’s why sometimes it’s hard for us to have faith. Because faith is what we will receive but not yet seen. Do you realize that in this scripture, it doesn’t said that Jesus answered with a loud voice like the ten leprosy? This could only means that Jesus drawn Him self nearer to them, He came to them! He didn’t feel disgust by their broken skin and body. There is power in praise, there is power in worship and yes there is power in prayers. He didn’t tell the ten leprosy to do anything, to cleanse Him self first, or to do something first. No, He came as they called His name. This is grace. We can’t buy His grace by what we do, grace is something He gives us for free and not because who we are and this grace is your healing or your answer to any of your burden. In this scripture, He didn’t tell “you are healed.”, in fact, He told them to go to the priests. At that time, the priests were the one who could diagnose their sick and decide what to do with them. So, it’s not even a healing word. They probably got confused why Jesus didn’t heal them at that time. I’m sure they have faith when they called His name, i bet they knew that they will be healed that day! But when Jesus didn’t say the “magic word” and told them to the priests their feeling must be shaken, discouraged and dismayed. They are still the ten leprosy men. But they obeyed. Healing is a great miracle, but that is not the greatest miracle. The greatest miracle is we are being saved. We are being changed, we are lifted up from the darkness to the light. This Samaritan chose to not only healed but saved while the other are satisfied with just their healing and forget The One who heals them, they missed the chance to have God’s peace and greatest blessings and grace. He has died for you, now it is your choice – Jesus won’t push you to follow Him if you don’t want to, but when you decide to call His name, He will straightly come to you and give you rescue. He always yearns for you. He wants our pure love and heart. No matter how far you’ve been away from Him, all you need is come back and call His name. As i said on previous posts, we need to be thankful for every little healing, even if there isn’t any healing happening, pray for a thankful heart to be able to thank for every little thing we still can do. Just like me, in those dark days i then know that everything that happens on my life are because of grace alone. Like if i could take a bath, sleep well, working, walking, laughing, sitting and even just seeing are all because of His grace only. We are not controlling our life. He is God and we are not. Aren’t you feel the same way after maybe some sickness, or troubles came along? It’s not too late, He never gives up on us. I am healed by His grace and am so thankful for my healing. I could be married and have a normal life again. But what i thank the most is that Jesus saved my life once again, He totally changes my life. I am no longer me that was so arrogant who never fear God, i am no longer living under darkness. I can feel His peace, His love, His mercy – I can speak to Him and hear His tender voice, I can praise Him with joyful heart and feel His blessings through everything everyday. Feeling His grace is the most wonderful thing. I know He has purposes for my life and yours , but now i won’t run no more. I am ready to step into His plans. Faith is not a feeling. Because if it’s based on our feeling then our faith will be like a roller coaster that’s always up and down. 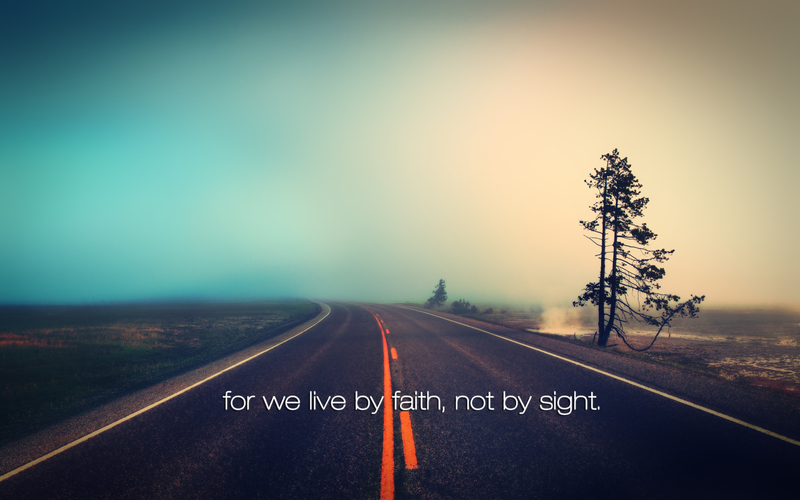 Let your faith be firm by not seeing what is seen, let your faith grow – not bigger – we only need a mustard seed faith, right?! – but grow stronger by each day. No matter how many you’ve fallen, wake up and grow your faith again. He is the source of Faith. All you need is ask, He will send you strength that you never have before. [ENG/IND] Where is your faith? / Dimanakah imanmu?